In this timely and comprehensive book, a professional with rare experience in policy making reminds us that merely casting our votes is never sufficient, we must be constantly involved with the decisions which affect us in our daily lives, and the country. On May 28th, I wrote the article in the ET; ‘Bureaucrat Mukt Bharat (http://blogs.economictimes.indiatimes.com/et-commentary/steel-frame-of-bureaucracy-is-an-obstacle-to-development-its-time-to-rehaul-it/). We need speed, we need efficiency and we need effectiveness in our entire chain of command. This is the pre-requisite in realizing the vision of the greatest statesman – Modi. Unlike the politician, who have to go to the electorate every five years seeking ‘votes’ as his ‘appraisal’ for the performance, bureaucrats come with a ‘seniority based promotion’ and a defined retirement age and hence, they are least bothered for their performance reviews and also that these ACRs (Annual Confidential Reports) for performance reviews can be ‘managed’. Most of the bureaucrats are there for ‘authority’ and ‘administration’, and not development. Their approach is to ‘control’ and ‘Govern’ and not – ‘work as a team’ for ‘development’. Also, if one gauges the real working of majority of these bureaucrats, they don’t work for anyone, but they work for themselves, and then, there are ego’s, differences, grudges and dislikes for other bureaucrats. So there is never a ‘team approach’ in whatever they do and this drags the performance of the Government. Bureaucrats are more ‘procedure driven’ than ‘Outcome driven’. They focus more on following procedures and not necessarily on the outcome or performance, and that is why files take months to travel from one desk to another. Famously, one of the best performing Minister, Sh. Nitin Gadkari said on 09th May 2016, that it took him a 9-month wait for an approval for an automated parking. This is when Sh. Nitin Gadkari ji is known for being really fast in getting things done within the bureaucracy, and hence we can imagine what other ministers must be facing! So, the time has come when we think out of the box and overhaul this system. Else, in 2019, our biggest failure will be because of the inefficient and unaccountable bureaucracy who will fail to implement Government’s key schemes. We need to focus on the team approach; ‘One India, One team, one Goal’, that touches and transforms life till the last man standing in the line. For any of the misses, the weightage be objectively apportioned. The government works for the citizens, and finally it is the citizens who are the best judge of its performance. Parameters 1-6 above can be objectively judged with data / facts, and others can be subjectively judged by the citizens under Jan Bhagidhari Assessment (JBA) through online voting. At the end, it is the Government ‘for the people’, so the people must rate the Government on overall performance through public voting, after Government presents its self- appraisals on the points mentioned from 1-6 above. The voting should be open for 30 days for the public to vote by a missed call from their registered mobile number on a toll free number; (60 % weightage should be assigned to public perception / judgment on performance) and 40 % on self appraisal / independent assessment by the Government. Major change in bureaucracy is about making it a ‘performance based contractual service’: Also, one reaches the rank of Joint Secretary after a minimum service of 17 years. Joint Secretary is the actual ‘official’ who runs the show for the Government on a day-to-day basis, but if one sees the performance of the Joint Secretary, in a real sense, s/he does not feel accountable to anyone. The reality is, that now they are more driven by authority and administration and less by duty and development. The biggest bane of bureaucracy is their job security and on one can demote them or remove them. When politicians have to go every five years for their performance review and renewing their term before the electorate, why should the top officials not undergo a review and renew based on their performance? Let us give them job security, but for performers. The Government is serious about a ‘Big Change’, and has to go and seek appraisal from the voters in 2019, but most of the bureaucrats are not as serious. They have been used to seeing government after government for decades. For them, this is all routine office work but for the Government, it is an implementation emergency. This is the only way to bridge the divide and bring about a cultural change for performance, accountability and rewards. Today, only the politicians are accountable but not bureaucrats! And it is time to change and fix the accountability based transparent review process / system. All officers of the rank of Joint Secretary and above must be put on a 5-year contract, based on their performance review, with a performance based financial incentive for their outstanding work. So, the salary structure should have a fixed pay and a variable component . If they fail to live up to the performance standards (IPR) below 80 % for three years (out of five year term), they must be relieved. Let us not forget that the ‘Best are first to be hired and last to be fired’. So no worry for the best performers, rest should worry about themselves. Even, Nirmal Kumar Mukarji, the last serving Indian Civil Service (ICS) officer in India who retired as Cabinet Secretary in 1980, as chief guest at the Indian Administrative Service’s 50th Anniversary celebrations 1997, had called for an end to the all-India tenured services. Also, PS to the Minister is considered an important bureaucrat but he is a junior IAS. (below the rank of Joint Secretary), and hence s/he plays safe dealing with his seniors, as one day he might have to work under them, and the loser in this case always is the Minister. So, we need to consider that the PS to the Minister be a Special Secretary rank . Modi has the intent, the will and the vision and he is working really hard. Will his administrative system be able to catch up? There is a big difference in how the minister and the common man are handled by the bureaucrats. So the first impression here, should not be the last impression! Bureaucracy is slowly putting red tape to the red carpet ! It is a known fact that when symptoms become visible for a chronic disease, complications are tough to treat and the disease is in an advanced stage, but if the disease is diagnosed in earlier stages, the diseases are easy to treat and cure. In India, now symptoms like fiscal deficit, current account deficit, increasing NPAs, inflation, unemployment, lack of investment sentiment, withdrawing of investors etc. are symptoms of a economic earth quake (what I call as econoquake), and it is like a disaster in slow motion for India. The Indian economy has passed through its worst phase after independence since 2004 and the rot continues to grow. 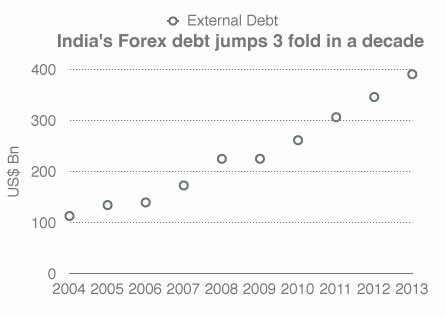 If the 10-year RBI data on short-term foreign debt is analyzed, it is fairly obvious that the UPA destroyed the value of the Rupee. In 2004 when the Vajpayee Government was voted out, the foreign debt at $ 112.4 billion was well covered by the forex reserves. Nine years later it has grown by 350 percent to $ 390 billion and the forex reserves cover falls 25 percent short. However the rise of foreign debt is not the only reason why the Rupee collapsed from Rs 39 to a dollar to Rs 61 for a dollar during the intervening period. Foreign debt is a necessary evil that is needed by developing countries to push forward their needs to fund foreign capital funded infrastructure. Usually such addition of infrastructure results in long-term asset building that adds to improved productivity of the nation. However in India’s case the rise of external debt has been primarily to fund the current account deficits catering largely to the working capital needs and funded through the short-term loan at higher interest rates. 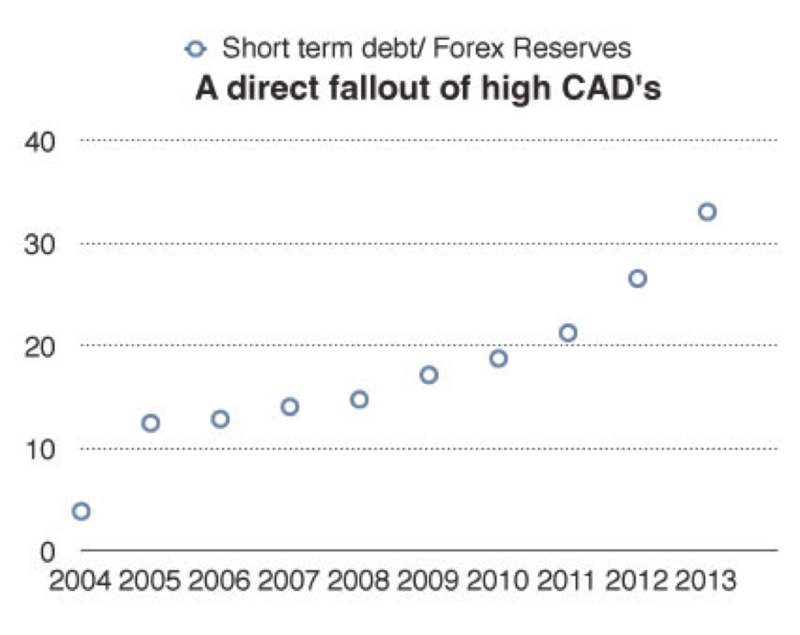 This short-term debt component was very comfortable at just 3.9 percent of the Forex reserves when the NDA was voted out of power nine years ago. By 2009 when the UPA II was re- elected it was around 17.2 percent and by March 2013 the short-term external debt rose to a whopping 33.1 percent of the Forex reserves, which had fallen to $ 292.65 billion. With the reserves further dropping to $ 280.18 billion following RBI’s intervention to stem the Rupee slide in July, the ratio would have worsened. Short term debts and the External Commercial Borrowings that would need repayment during this FY 2013-14 is high and would cause large outflow of dollars and put pressure on the currency intermittently. For example during May 22 and June 19 there was a net debt outflow of $4.7 billion, one of the prime reasons why Rupee tanked. 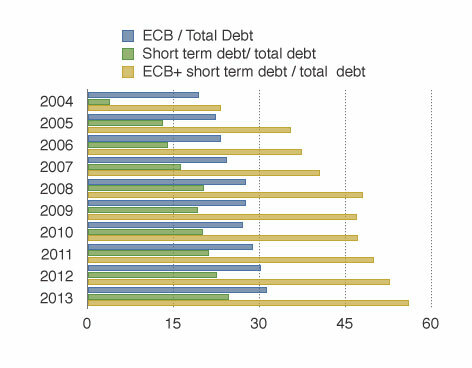 These ECB’s and short-term debt have grown to an enormous 56 percent of the total debt by March 2013 almost 2.5 times what they were when the UPA came to power nine years ago. As per RBI data short term debt payable during this Financial year is $ 96.7 billion while ECB’s with 6 month to 1 year maturity that need to be repaid are around $ 21 billion, and NRI deposits maturing during the year are $49 billion. The Rupee is catching a cold because the total foreign debt to be repaid this year works out to a massive $172 billion that is around two-thirds the foreign exchange reserves. Even if interim measures to stop speculation are taking by the RBI it will not address the inherent weakness of the system. Rather it may enhance volatility, as speculative traders if restricted will move offshore to short the Rupee. Why rupee will continue to fall? CDR gives an indication that the corporate sector is crashing! The latest data from the CDR cell suggests that Indian banks added Rs. 15,016 Crore of restructured loans in the March quarter, about Rs. 9,000 Crore less than what they had done in the pre ceding quarter. On a cumulative basis, total restructured loans crossed Rs. 2.27 trillion, or 4.4% of the total loans given by Indian banks. Gross non-performing assets (NPAs) of 40 listed Indian banks rose to Rs.1.79 trillion in December fromRs.1.25 trillion a year ago, an increase of 43.1%. In the past, the Reserve Bank of India (RBI) had cautioned banks about the need for enhanced risk assessment tools to monitor loan quality. Defaults in Agricultural credit in another bubble? A surge in exposure to farm debt through Kisan Credit Cards (KCCs) could emerge as a risk for India’s state-run banks, according to experts. Subsidized loans are given to farmers through KCCs by state-owned banks. Until March 2012, the outstanding amount on such loans was Rs.1.6 trillion through 20.3 million cards, as per the latest Reserve Bank of India (RBI) data. This may have risen to around Rs.2 trillion, bankers said. Agriculture is one of the largest sources of bad loans for most banks. It is contributing 9.72% to the gross NPAs of SBI and 7% of Central Bank of India. The nation’s largest lender SBI has the largest gross NPAs —Rs.53, 457.79 Crore, or 5.3% of loans, followed by Punjab National Bank (Rs.13, 997.82 Crore, or 4.61% of loans), Central Bank of India (Rs.8, 938.47 Crore, or 5.64% of loans) and UCO Bank (Rs.6, 711.29 Crore, or 5.53% of loans). Government’s efforts to promote India as an investment destination does not seem to be yielding fruits as FDI inflows registered 38 per cent decline to $22.42 billion in 2012-13 compared to the previous year. It is clear that the UPA government is on the ventilator and no sensible MNC or investor is going to even announce investment for during this government. Knowing well, that the next government will certainly not be either from congress or due to its support. That is one major reason why we have seen in the last week POSCO cancelled its Rs. 30,000 Crore steel plant on July 16th, L.N.Mittal cancelled its Rs. 50,000 Crore steel plant on 17th July 2013. This is a loss of Rs. 80,000 Crore worth of investment committed to India. Normally, when the government is about to be re-elected, we know that practically, all the companies wants to wash its hands in Ganges, and get speedy approvals for obvious reasons. A ‘Needy’ political party in power wants to ‘cash in’ and so does the ‘greedy’ corporates. We have seen how business leaders get national awards like padamshree and padmavibhushan in the election years or the year preceding the election year … but this time, the scene is different. No sensible business house, no matter how ‘greedy’ it is, will commit any investment before the next general elections. So, I see no respite to Indian economy till 2014 end or may be, 2015. FII’s the real culprits for rupee slide? May be! (1) OECD data on FDI in Figures as on January 15, 2013. (2) Zenith International Journal of Business Economics and Management Research, July 2012. (3) World Investment Report various issues. Please see how foreigners are investing money in stock markets, and have taken over 100 Billion USD (108.8 Billion dollars, Which is 6 % of India’s GDP) outside India just in one year (2011-12). How will our Finance Minister address the Balance of payment issue, which needs 75 billion USD? Dr.Akash Mehta compiled this data on FII’s on my request. Acknowledged with thanks Dr.Mehta. Car sales in India fell for a record eighth month in row in June with a dip of 9 percent as economic slowdown and low consumer sentiments continue to hit demand, prompting industry body SIAM to seek stimulus package for the automobile sector from the government. With actual sales in the first quarter of this fiscal turning out to be wide off the mark from what it had forecast in April, Society of Indian Automobile Manufacturers (SIAM) stayed away from revising sales projections it had made in April this year and stated that even those targets were unlikely to be met, except in two-wheeler segment. According to the latest figures, domestic car sales stood at 1,39,632 units in June as against 1,53,450 units in the same month last year. We know the problem. So what next? India has focused too much on FDI / FII’s to bring in dollars, and the capitalists countries are like Shylock (Merchant of Venice). They will extract their pound of flesh. So, India got quick dollars from FII’s, and FII’s made quicker returns and exited the markets and today FIIs have 11 % of the investment in stocks, as I have given the data above. The fact is that, a clutch of foreign investors can destabilize India by withdrawing their investment. FIIs are short-term hedgers and they damage infringe long-term damage to our currency & country. Small retail investors become bankrupt because of FIIs. What came out as a myopic solution to our fiscal deficit and balance of payment crises has today turned into a major national security issue? Economic Competitiveness: We need to focus on economic competitiveness. We have lost in the last few decades. Areas to focus, agriculture – we need to amulify agriculture (taking a cue from Amul’s experiment of cooperative movement in milk). We need to support farmers. Make a paradigm shift in modernizing agriculture, training, and equipping farmers to set up SME food processing units. This should make us the top most processed food country in the world in the next decade. The national highways project of Shri. Vajpayee (Golden Quadrilateral Project) was the best step taken since independence for inclusive growth, and this must be pursued aggressively. During NDA regime the road building was 20 KMs a day and under UPA it is down to a KM or two. The Atal Behari Vajpayee government bequeathed a robust economy to the UPA. Remember that the growth rate registered in 2003-04, the last year of the NDA regime, was an impressive 8.5%. 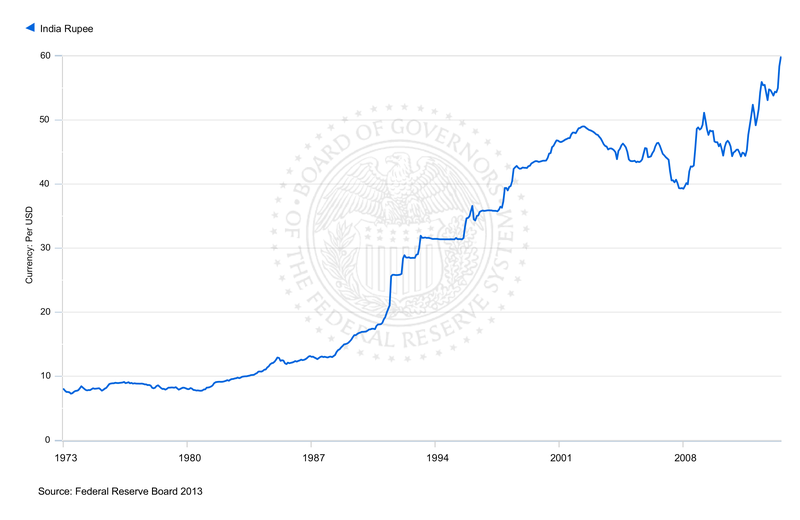 Foreign exchange reserves were plentiful. General prices were well under control. Share markets were booming. And there was a general sense of well-being. Work on the Golden Quadrilateral highway linking four corners of India was on in full swing. And various public infrastructure projects under the Public-Private-Partnership model were proceeding without any hitch. Tourism- spiritual tourism – Tourism is the next best bet after agriculture and we must focus on it by innovating in this sector. I have detailed plan for creating millions of jobs and billions of dollars through employing matriculate youths in this sector. Intellectual property (IP): India has become a sweatshop and nothing wrong in it, but we need to focus on building IP in science, technology, defense, & agriculture. It is shame that India has not even built a software platform (operating system) and still relies on Microsoft and IOS. Indians in software arena should take a challenge and build the best operating system rather than spending billions of dollars buying MS Office and Apple operating system or Google. We need a search engine developed by Indians. India spends billions of dollars on universities but the IP registered by just one company Texas Instruments (for the sake of giving example I am quoting Texas Instruments) from its Bangalore office might exceed the patents granted to researchers in Indian universities. We need a complete over haul in our education systems that give the world the most valuable IPs, which can be monetized. Geographical indicators (GI’s): We all are aware that many Geographical Indications like Darjeeling Tea, Mysore Silk, and Champagne across the world have become premium global products. While protection of GIs is very important, it is all the more important to extract economic benefit out of registered GIs. In India we have 184 Indian GIs has been registered till now but hardly a few of them have accessed global market. On the other hand we are also seeing growing number of GIs from other countries like Peruvian Pisco, Scotch whisky, Cognac, Prosciutto de Parma, Tequila etc. have registered in India. While it is understood that not every Indian GI has the potential of capturing global market, but many of them have. However we have not seen enough initiative and support system for such promising GIs having healthy export market. There must be a plan to build on the legacy of these GI’s, and targeted GI must be turned into a USD 10 billion global markets for Indians. Boost manufacturing with a focus on SME’s: Women’s employment has taken an alarming dip in rural areas in the past two years, a government survey has revealed. 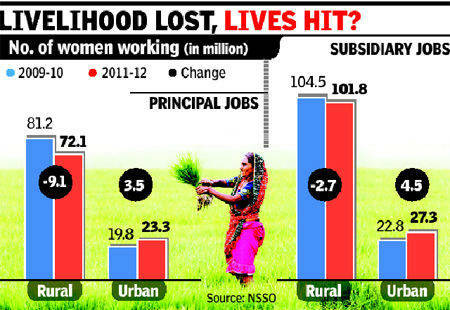 In jobs that are done for ‘the major part of the year’, rural women lost a staggering 9.1 million jobs. This emerges from comparing employment data of two consecutive surveys conducted by the National Sample Survey Organization (NSSO) in 2009-10 and 2011-12. NDA, during 1999-2004, 60.7 million jobs were created while UPA Government, during 2004-2009, created only 2.7 million jobs. (Data source: National Sample Survey Office). Organic farming, Herbals & Nutraceuticals: The whole world is moving to traditional and complimentary medicine and India has a scientific traditional medicine dating back to 5000 years. We can create rotation farming for herbals and organic foods and create millions of jobs and billions of dollars worth of exports. Foreign policy: Neighbors can help. We need not be hooked to G8 / 14/ 20. It is time to have a strategic alliance in Asia, A-2 (India and China) on the lines of G-4, we need to create A-4, the big 4 Asian economies must come together to lead Asia. This is where India must initiate moving from G-20 to A-4. Lastly, it would not be wrong to say that lakhs of small and medium enterprises , and even 27 big corporate houses have 41 trillion rupee debts (http://www.livemint.com/Companies/7TnLNfHilL2UOkPVNku8UM/Kumar-Mangalam-Birla-is-the-highestpaid-director.html ) . So , this is a steriod induced survival for most of the corporate entitites be it small or big .More pain is expected by this year end. So the government needs to keeps its head low and overheads lower and find solutions to avoid NPA’s . Though, it is an another thing, that UPA has in itself become an NPA. On 22nd March 2012 , I wrote this on my blog and also sent the same to leading public figures .I had stated dwelling in detail about how, ‘ Have we oversold the India story’, and this was much before the bad news starting sinking in ! Link to the blog is https://commonmansblog.com/2012/03/ . This blog clearly mentioned that we must be prepared for bad news in April – May – June Quarter , and we know that, India was downgraded as an economy by the international rating agencies ( S&P & Fitch ) and many Indian banks also faced the brunt , many retailers are gasping for breath …. This time , I have decided to write about the story of how Indian economy would enter a dark phase if immediate steps are not taken ,and this note is not against anyone but for everyone who wants to see India doing well ! I have tried my best to put data for every statement ( Besides Almighty , everyone should believe in data !). So now , it is time to peep in the story of how an emerging economy can become a submerging economy . Telecom Sector Rs. 2.00 Lac Crore debt TOI, 26th September , 2012. Banking Sector Report by Credit Suisse group AG points that exposure to 10 large Industrial groups constitute 13 % of the entire banking system Mint, August 21, 2012. Banking Sector As of 27th July, Indian banks had loans outstanding of Rs.36,600.00 Crore to the mining and quarrying sector, and Rs.93,170.00 Crore to the Telecom sector Mint, 12th September, 2012. Reliance ADA Group Rs.86700.00 crore FY’12 Business Line August 26th, 2012. GMR Rs.33600.00 croreFY’12 Business Line August 26th, 2012. JSW Rs.40,200.00 crore FY’12 Business Line August 26th, 2012. Jaypee Rs.45,400.00 crore FY’12 Business Line August 26th, 2012. Lanco Rs.29,300.00 crore FY’12 Business Line August 26th, 2012. Essar Group Rs.93,800.00 crore FY’12 Business Line August 26th, 2012. Vedanta Rs.93,500.00 crore FY’12 Business Line August 26th, 2012. Adani Group Rs.69500.00 crore FY’12 Business Line August 26th, 2012. Videocon Rs.27,300.00 crore FY’12 Business Line August 26th, 2012. GVK Rs.21,000.00 crore F’12 Business Line August 26th, 2012.
Business Line dated August 26, 2012: Credit Suisse said that the aggregate debt of the ten groups accounts for about 13 per cent of total bank loans and a whopping 98 per cent of the entire banking system net worth. “Therefore, surprisingly now in terms of concentration risk, Indian banks rank higher than most of their Asian and BRIC counterparts,” it added. The report said a strong loan growth of Indian banking system in past five years is increasingly being driven by a select few corporate groups. “Given the high leverage, poor profitability and pressure from lenders, most of these debt heavy groups have initiated plans to divest some of their assets. However, given that most domestic infrastructure developers are already over-geared, demand for these assets may be limited,” Credit Suisse said. Each of these groups alone account for 1-2 per cent of total banking system loans, the report said, while noting that all banks appear to have high exposure to the same few groups. “With the economic slowdown and a downturn in these sectors, multiple assets of each group appear stressed and financials of these groups are stretched,” the report said. Despite an exposure / investment of about Rs.4.37 lac crore from banks ,still five lac houses remain unsold ( ET, 22/ 08/2012 & TOI dated 18/ 09/ 2012. ) . So land became costly as the builders brought them with loans , houses became expensive due to builder cartels and now that houses are not getting sold , all are a part of the downturn ……..no solution is in sight except for NPA’s and its cascading affect later . Clearly, Indian economic story lacks ‘depth’ but has been built on ‘debt’ and this is a painful bubble waiting to burst …. So a common man must have enough savings to last a few years if without a job ! July 26, 2012 in TOI, it was reported that at least eight cases of FDI in some obscure real estate companies – each worth more than USD 100 Million – from Singapore have come under scanner , with Income tax Overseas unit (ITOU) having investigated them for alleged round tripping . Suspicion was raised when authorities detected huge FDI inflows into some little known real estate firms in India in the form of equity participation . A senior finance ministry official said they suspect these real estate firms to be front entities of some corporate houses and their black money has been routed through Singapore to acquire real estate in the country . All these FDIs coming from Singapore pertain to 2011. India received Rs.1.74 Lac crore worth of FDIs in 2011-12, of which Singapore contributed third highest at Rs.24,700.00 , after Mauritius ( Rs. 46,700.00 crore ) and the U.K ( Rs. 45,000.00 Crore). So , now we can understand why an Indian’s politician’s family have a flat in Singapore and why Indian Government along with a few ‘parties with vested interests’ are pushing for FDI ! Does it also not answer the question why Government opened the real estate sector to FDI in 2005 ? So that money stashed abroad can be brought back in real estate sector, and further money could be made by investing in and increasing the prices by buying land ! Does Lavasa ring a bell in your ear ! 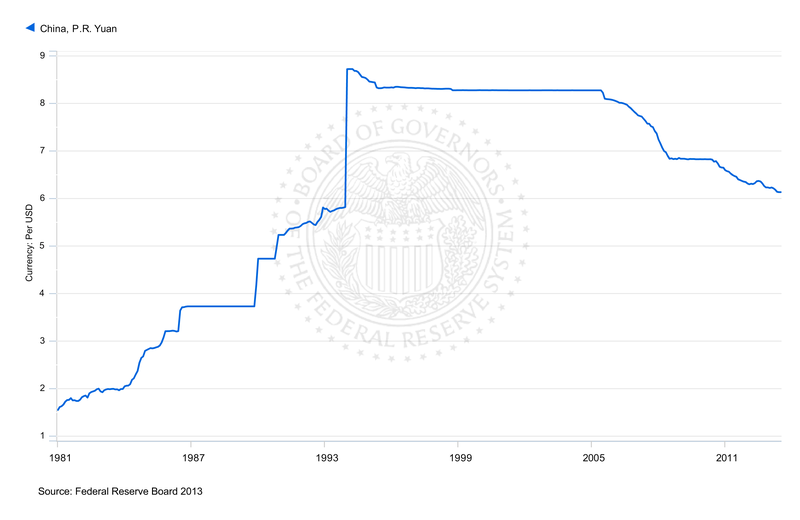 In absolute terms, bank’s bad assets have doubled in three years between 2009 and 2012 – from Rs. 68216 crore to Rs.1.37 Lac crore ( Mint 21st August , 2012). Bad assets in coal, iron and steel , mining , construction , textiles and aviation sector have been on the rise . Bankers see stress in telecom and power sector, too. The biggest beneficiaries of loan restructurings are large industrial houses in the manufacturing sector – 8.24 % of loans given to industries have been recast. In the services sector , the comparable figure is 3.99 % , and in agriculture loans , 1.45 %. It is clear that the small borrowers don’t get relief from loan servicing but the large industrial houses have gotton one ( Mint , 21, August ,2012. ). According to the same article , public sector banks have 90 % of the restructured assets , and this in my view clearly states one fact – a strong political – bureaucratic and business houses nexus to make loans and buy private jets and show companies in losses to the investors ! What right do the business houses have to question the Government on profligacy and spending when these business houses have huge debts but have their CEO’s / promoters taking home 10’s of crore in salaries plus stakes in companies and still flying private jets on borrowed money ! We know of the large business house where the debts are more than revenue but the flamboyant chairman / promoter flies on private jets ! Such company’s ( any company that has over Rs. 50 crore external debt ), boards must be restructured by the MCA (Ministry of Corporate Affairs) and independent directors with fixed term and remuneration should be appointed by the Government , so that the loans and shareholders money is not misappropriated by such promoters in the name of expenses and privileges ! India S&P rating is BBB (Minus) . Outlook – NegativeFitch rating is BBB (Minus ). Outlook – Negative ( TOI, 26th June, 2012 ). Agriculture / Food crises : The US is facing a severe drought , and India has witnessed a bad spell of monsoon this year with erratic and unpredictably low rainfall . When India imports pulses and oilseeds , & the prices of these commodities is set to rise. Stock piles of the biggest crops will decline for a third year as drought parches fields across three continents , raising the food-import costs already forecast by the United Nations to reach a near record $ 1.24 trillion . Combined inventories of corn, wheat, soya beans and rice will drop 1.8% to a four year low before harvests in 2013, the US department of Agriculture ( USDA) estimates . Crops in the US, the biggest exporter, are in the worst condition since 1988, heat waves are battering European crops . Wheat production in Russia , the fourth largest exporter , will fall 20 % this year , and in Australia , output will decline 19 % and, God forbid, another year of bad spell of rain in India will spell disaster for this country . This situation warrants an emergency action ! On 9th August , 2012 on page 7 of ET, I read an appeal to the GOI by All India Starch Manufacturer’s Association regarding the crises due to non-availability of maize in the domestic market. Even if starch manufacturers were ready to buy maize at higher prices, it was not available and adding to it was the monsoon failure ! We are all awaiting a miracle to happen with Wal-Mart et al. But the reality is that these players have not much to contribute. We must not forget that , the supply chain structures in these companies are leaner and they work on shortest inventory, so clearly , these people will not do much for supply chain management . Also, the biggest contribution is stated to be creation of 10 million jobs in India . I wish to ask that these companies have a ROI ( Return on investment ) for each employee and so , clearly , we must see what is the cost that we are going to pay to these MNC chains for them creating 10 million jobs & the Government must come out with a white paper on this ? After all , Wal-Mart is not here in India for charity ! For sure , it would mean we paid will pay them dearly for doing what we could have done 100 times cheaper ! All FDI investments to me appear to be taking the ‘economy in debt’ to ‘sell off’ ( divestment )… We are back to what East India Company did to India but this time , it is not one company, but multiple East India Companies ! In 1950, India had a population of 350 million and now it is 1210 million. During independence, the population dependent on agriculture was 72% and now it is 54 %. But except Madhya Pradesh, where agricultural growth has increased to dramatically , not much is visible in other states . For these firms , the interest coverage ratio (ICR), for fiscal 2012, plunged 1.9 times , the lowest in at least five years. In other words , for every Rs. 100 of interest payments, the firms earnings before interest and tax ( EBIT ) stood at Rs.1.90 . The comparable number for 2007 was almost five. In the fiscal 2012, at least 17 firms did not earn enough to pay the interest ! The list includes some of the bigger and better known firms such as Hindustan Construction Co. Ltd, Gammon Infrastructure Projects Ltd and GMR Infrastructure Ltd. This might give us a sense of where India is headed . First we oversold the India story, and now we are gonna pay heavily for it ….. ! According to the NSSO survey( July 2011 – June 2012 ), 10 % of India lives on less than Rs.17 a day . As per the survey , half of the population in rural India was living on a per day expenditure of Rs. 34.33 , and this is after two decades of reforms in India ! Millions of tonnes of grains are stored in the open as we have no place to store ! I have travelled to the draught prone areas, and heartland of farmer’s suicides i.e. Vidharbha region of Maharashtra . Lanco is setting up a power plant in Wardha and has purchased land for as high as Rs. 25 lac per hectare ( as per the farmers statement ). So , let’s look at this example where Lanco purchased 7 acre land from a farmer for Rs.1.75 crore . A farmer who was drought and debt ridden for years becomes a millionaire overnight, and buys a SUV for himself along with a rifle , gold jewelry for his wife , builds a pucca house with the money he gets , and the money is spent soon as he did not know how to plan and how much to spend and the land is also gone to Lanco ! Also, money brought in a lot of vices ( please check the number of AIDS patients in the region ! ). This company Lanco, runs a debt of Rs. 29300.00 crore and has gone for CDR ( Corporate debt restructuring ). The banks that gave the loan should be ready for a NPA ( Non-performing asset )! So , the farmer , the company Lanco and the bank have become a non-performing asset ….. whereas , the farmer buying a SUV, Gold etc, would have boosted the sale of vehicles , gold, wines, apparel companies temporarily , and soared the rates & increased the GDP ! So this is growth in GDP but not a sustainable one or growth without prosperity ! Indian population a mere statistics ? Let us take the example of the recently concluded London Olympics . China with a larger population came 2nd with 38 gold , 27 silver and 23 bronze medals and India came on 55th position amongst 79 nations with zero gold , 2 silver and 4 bronze medals ….. this is what our leaders have led us to ! With committed leadership we must have made it the top by now …..
Let us do a rough sum of Indian economy which has a GDP of approximately Rs. 100 lac crore and we still borrow about Rs. 5.2 lac crore every year, and we already have debts of about Rs. 45 lac crore . India’s 42 % of the net annual tax revenues of Rs.7.71 lac crore goes in servicing its debt ( Rs.3.20 lac crore ). Another 25 % goes in subsidies ( Rs.1.90 lac crore ) – an annual amount that would actually be Rs.78000.00 crore higher if off-balance sheet fuel subsidies to oil marketing companies were included. The fiscal deficit of Rs.5.19 lac crore – 5.9 % of nominal GDP – is 67 % of the net central tax revenue . This was detailed in TOI dated 19th August 2012. I had read somewhere that , 54 % of Indian’s income goes in interest payments on debts taken for decades , 30 % is the cost of running the inefficient Government & bureaucracy and 16 % for subsidies ……so I keep wondering , does India have any money at all to invest in infrastructure or for future !!!! ( Hope I am wrong in remembering these numbers and India does better ). If not , time to take action ! According to Apparel Promotion Export Council ( APEC) , an estimated 4.5 million jobs have been lost over the past 3.5 years . Do our policy makers know how an ordinary Indian would survive without a salary for even a week and what pains his family and relatives pass through him being a jobless ! If all of you witnessed the discount sales season, it was advanced and even extended to make up for the shortfall , and this must show the desperation from the companies to meet the numbers . Unfortunately , If corrective steps are not taken immediately , we will have more companies getting into CDR or closure and millions of jobs might be lost till 2015……worst is yet to come ! Let me quote a facts about why India gained political independence and what was the average age of leadership . Maulana Azad became the President of INC at the age of 35 , Bose became the President of INC at the age of 41 and Nehru became the President of INC at the age of 40… So now we know why we got political freedom and why we have not been able to get economic freedom ??? For a nation with more than 65 % of the population below 35 years , it is important to take care of the representation of youth to lead this country with fresh innovative ideas for a double digit growth and that too grounds up. Though our policy makers tell us that we cannot grow at about 8 % , but the fact is that, in 2011 calendar year , 12 countries clocked more than 8 % growth and some of them like Ghana , Iraq , China , Argentina and Turkey are not exactly small . We have been capped by the ‘old school of policy makers’ and their thinking , who believe that they know all and what they do is right ! This has to go now ! We need leaders with a nose on the ground , good governance and a strong political will and rest will fall in place . Government must earn from the rich and middle class, and help upgrade the lower income class to middle class on a ‘mission mode’ basis by empowering them by providing them training , education, healthcare and technology . Our country’s finance ministers have taken to ‘Populonomics’ ( Economics of populism ) , and not ‘economics’, and this has clearly shown the results to the common man . India is heading towards an economic disaster and short cuts like FDI are short lived solutions ! I can bet you that if a party rises above caste , religion ,reservation, dynasty , and parochial regional politics, it is sure to win the youth and come to power without taking to populism ! It is the time for the finance minister to move from being an ‘efficient tax collector’ to ‘passionate creator of wealth through innovation & entrepreneurship ’. India is the only country in the world at this time that has ample opportunities for each problem to be solved and is a fertile basin for innovation ! If you were born as a human- being , you must be lucky, but if you are born as a human -being and that too, in India , you must be the luckiest on earth, and this describes our India today and what it can offer to the world ! I am not an economist, though , I have studied economics during my graduation ( but I must confess that I do not remember anything I studied during graduation J , and I am glad that I don’t remember anything J) All that I have written here is a common man’s perspective from the data and facts available in the public domain. I have researched the state of economy well over five months to help our dear policy makers to do a better job and making the life of a common man better and not bitter !